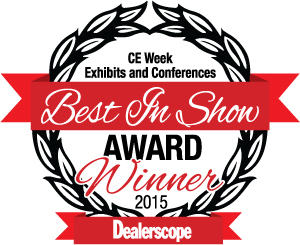 Mol, Belgium, 25 June 2015 – The Auro-3D® Crux™, one of Auro Technologies’ very own AV processors, has been selected to receive recognition as a Best in Show winner in the ‘Home A/V Components’ at CE Week 2015 in New York. The Auro-3D® Crux™ is the first integrated true 3D sound home cinema processor to deliver high end audio features at a price point for a wide range of home cinemas and media rooms, making full immersive 3D sound available to those installations for the first time. It marks the next generation in high-resolution 3D audio. The Auro-3D® Crux™ brings professional cinema audio technology to the home with its stylish design, ideal for both in-room as well as rack mounted installations. Auro-3D® is set to revolutionize the home theatre world and creates the most immersive experience around the listener, which surpasses anything you’ve heard before. Mol, Belgium, 15 June 2015 – Auro Technologies will be showcasing immersive sound solutions featuring its ground-breaking Auro-3D® format at CE Week 2015, with continuous 3D Sound demos, panel talks at the Next Audio Conference and Ozark Henry explaining how Auro-3D® revolutionized the way he creates music. CE Week, June 22-26, is New York City’s largest consumer electronics (CE) and technology show. The event brings together top media, industry analysts and technology thought leaders for product debuts, a dynamic conference program and networking events all focused on innovative trends in the high tech world.